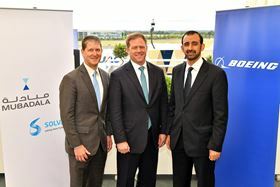 From left: Roger Kearns, member of the executive committee, Solvay, Kent Fisher, vice president and general manager supplier management, Boeing Commercial Airplanes, Homaid Al Shimmari, CEO of aerospace and engineering services at Mubadala. Solvay and Mubadala Development, an Abu Dhabi-based investment and development company, have created a joint venture to deliver composite materials for the empennage and floor beams of Boeing’s new 777X program. Solvay and Mubadala are creating a 50/50 joint venture to supply carbon fiber pre-impregnated (prepreg) composite materials to support the 777X needs. The new company will be located in the United Arab Emirates (UAE) and is expected to be operational by 2021. The companies formed a strategic partnership in 2013 to reinforce the development of the Abu Dhabi aerospace industry and to strengthen the creation of prepreg manufacturing capabilities. Mubadala will create the JV through its advanced aerostructures company, Strata Manufacturing. Located in Abu Dhabi’s capital of Al Ain, the JV will promote the establishment of a sustainable aerospace industry. Solvay’s prepreg technology consists of fiber reinforcements pre-impregnated with a resin matrix used in creating a composite part and can reportedly provide improved performance at lower weight compared to metal structures. This story is reprinted from material from Solvay, with editorial changes made by Materials Today. The views expressed in this article do not necessarily represent those of Elsevier.